I finally updated the blog’s layout and did some maintenance on the pages. Quinton Hoover passed away earlier this week, which is quite sad. 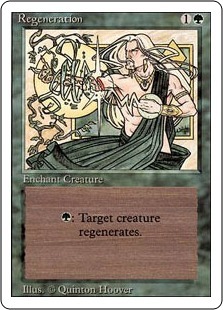 Regeneration from Revised was one of the first Magic cards I ever laid eyes on, so I am more sentimental about that card than most. I do very few alters these days – mainly because of time constraints. I have been working on digital commissions, which suits me just fine. No chance of water and paint spilling all over my desk! Durdling Around is also rolling along just fine. I added a sweet little Facebook box on the blog sidebar, so Like the page when you have a chance!